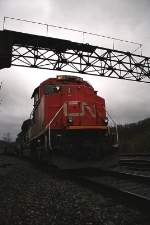 Description: A pair of CN SD70M-2s on SB CN train M31971 (Memphis, TN - Geismar, LA). Description: A Northbound freight comes through the wye. Description: CSX B780 and CSX B798/CN 326 sit in the compact yard at Huntingdon Quebec await fresh crews. Description: Q621 has 2 CN engines, a CSXT roadslug/GP40-2 pair.... and 7 NJ Transit engines! At the end of the freight were 14 NJT passenger cars. Description: train 343 heads north. Description: The WC heads out of Northtown, towards Shoreham, and up to New Brighton with an SD70M-2 leading. Description: A G-EDUPEI makes its way off of the Peavine. 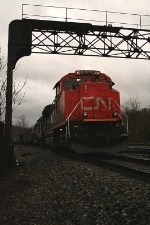 Title: CN 401 at Saint-Germain, mile 102.7 Drummondville Sub. Description: 8012 on head end of stack train crosses mouth of Bonaparte River. Description: I drove all the way to Ft. Worth expecting to find snow covered trains and instead found a locomotive from the snow covered north. Not a total loss.